Draw a little attention to yourself with this 7mm Multicoloured Freshwater Pearl and Transparent Glass Bead Stretch Bracelet. 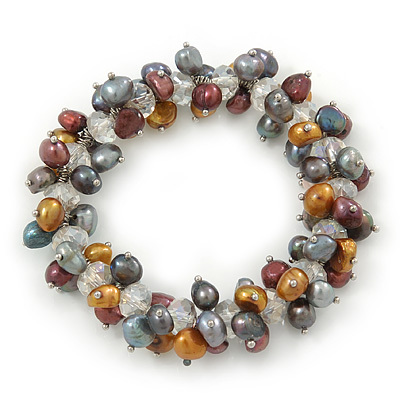 Featuring a cluster bead design, made of 7mm multicoloured freshwater pearls and transparent faceted glass beads. The stretch fit lends convenience to your accessorizing routine. Fits up to 18cm wrist. Fantastic gift idea for the ladies - mothers day, Christmas, birthday, anniversary or why not just treat yourself! Also, check our store for matching earrings E03411.